The MDX NON EMPTY Keyword will write the all the specified member whose values are not NULL. 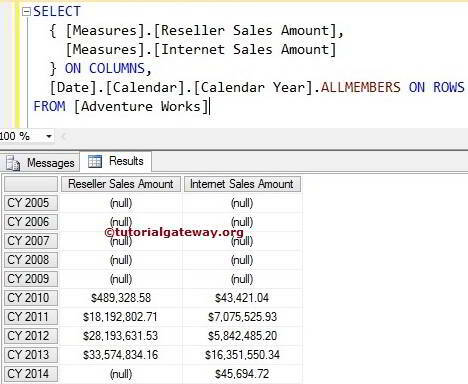 For example, When we are displaying the Non performing products, you may find few products with NULLs. In order to remove the NULLs we can use this NON EMPTY Keyword. Please refer below table to understand the MDX NON EMPTY output. 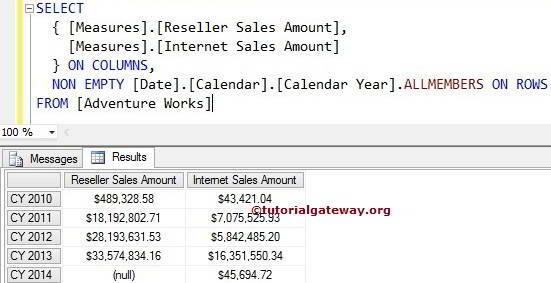 Non Empty keyword in the below lines of code will find the Calender Year whose Reseller Sales Amount is Not NULL and displays them as output. Non Empty keyword in the below lines of code will find the Calender Years whose [Reseller Sales amount] and [Internet Sales amount] values are Not NULL. It will display the result as we explained in the above table. As we all know, there is no Reseller sales and Internet Sale from Calender Year 2005 to 2009 that’s why Non Empty is displaying Reseller Sales for Calendar Year 2010, 2011, 2012, 2013 and 2014.